Having trouble finding curtains to go with your favourite Resene colour? 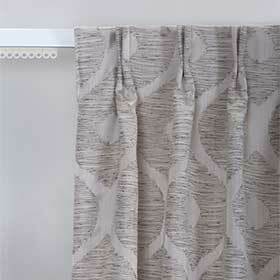 Then the Resene Curtain Collection may be just what you need to dress your windows and complement your room’s décor. Select your favourite Resene Curtain Collection fabric and purchase custom made pencil pleat curtains from your local Resene ColorShop and get them delivered to your home or get your curtain specialist to produce curtains/roman blinds or other drapery to suit. These fabrics are suited for window treatments and other soft furnishing items. Choose blockout backing for your drapes to help keep the warmth in over winter and keep the room darker by blocking out more sunlight. You can also choose to have your fabric made into cushions – check with your Curtain Specialist or Resene staff. The Resene Curtain Collection is available as custom made pencil pleat, dutch pleat, inverted pleat curtains or roman blinds from Resene ColorShops or get your Curtain Specialist to produce drapery and soft furnishings to suit your requirements. 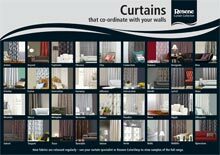 Find your nearest official Resene Curtain Collection stockist. Because of the nature of weaving and dyeing textiles, colour matching to previous deliveries or sample swatches cannot be guaranteed. Refer to “The Curtain Collection Fabric Range”. 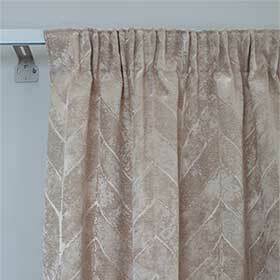 If the height of the curtain needs adjusting, you change the placement of the hook in the tape pockets - up or down. 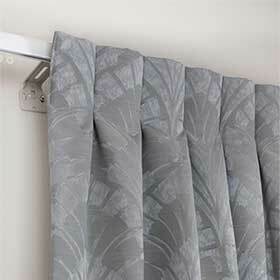 If the width of the curtain needs adjusting - either gather or ungather the curtain tape. Plastic tags - used to hold lining and fabric in place. Fabric Hems: Blind stitched - as to not be seen on the face of the fabric. Curtains are made to a custom quality. All 'pleat' curtains come in pairs to fit a track measurement when both drapes are gathered. The length/drop is made to the nearest centimetre (+/-1cm). If a single curtain is required - please see pricing and sizing. Our Resene ColorShops can organise fabric to be made into curtains for you. Choose from pencil pleat, dutch pleat, inverted pleat or roman blinds. Step 1: Select your Resene Curtain Collection fabric and note the design, colour and price group on the order form, along with your details. Step 2: Follow the 'How to measure' guide and note your measurements on the order form. Step 3: You can order your curtains either in store or online. Resene ColorShop staff can confirm pricing for you, or you can view pricing online. The specific amount of fabric you get per Resene Curtain Collection curtain depends on the fabric type and curtain style but the ‘pleat’ curtains supplied are made so that for every 1m of track you have 1.8-2m of drapes. All 'pleat' curtains come in pairs to fit a track measurement when both drapes are gathered. The length/drop is made to the nearest centimetre (+/-1cm). If a single curtain is required - please see pricing and sizing. The standard lining is a quality ivory coloured polyester cotton lining or you can upgrade to blockout lining. 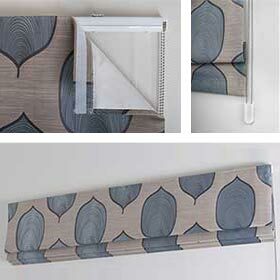 View a physical sample in the Resene Curtain Collection in store. All suppliers of the face fabrics are Oeko-Tex certified. Furnishings such as thermal backed curtains play a major role in keeping us and our homes toasty during winter and this leads many people to question whether or not their existing curtains are in need of replacing and whether the new curtaining should be a print, pattern or plain texture. There are no hard fixed rules but there are general considerations to take on board. New curtains can make as dramatic a statement as paint and wallpaper can. Curtains can and will change the mood or atmosphere in a room. It’s worth taking your time finding the right fabric and curtain style for your home. Curtains can make or break a space so it’s about partnering it up with other accessories, colours and furnishings and accentuating the space to make it the best it can be. Patterned fabrics are best used alongside solid colours and plain wallpapers. Patterns tend to work best when you want to create a focal point or a pop of interest in amongst a neutral and textural layered up scheme. Patterns can come in both tonal and bold contrast colours and can truly make a huge difference in a room. Pick a pattern that either complements the existing colour palette or one that contrasts (in a good way!). Patterns can also be used alongside other patterns when we echo the design style or complement it. Plain fabrics are at their best when our room already has an overload of patterns and prints or requires some softening down. Too much pattern spread throughout a room creates a busy and even messy look that can feel as if not enough care was put into the selection. When using plain fabrics don’t be afraid to use variations and different combinations of colour and textures to create interest. Plain does not have to be boring. What should you do with old curtains? If you are replacing your curtains, consider donating your old ones to a curtain bank to help low-income families who can’t afford new curtains.